The commonly accepted view of why the traditional brick and mortar retail business is imploding is that Amazon is out-executing and simply eating everyone’s lunch. While it is true that Amazon has built an incredible business around a number of significant competitive advantages and the consumer product discovery process has profoundly changed due to consumers’ adoption of mobile and social media — that doesn’t tell us the entire story. My view is retailers are suffering most from self-inflicted wounds in response to changes in market equilibrium between retailer, consumer and brand. They didn’t overbuild because they were stupid and felt like wasting money. They overbuilt because they missed early signs of rapid ecommerce adoption and the impact that mobile devices would have on steepening that adoption curve. That fundamental miscalculation combined with industry standard long-term leases for big box retailers, then further exacerbated with public earnings expectations driving aggressive store roll-out schedules formed the perfect storm for traditional brick-and-mortar retail. The outcome? Too much capacity, not enough demand. But the subsequent response to all that excess capacity is mostly self-inflicted. In most, if not all industries, long-term profits are compressed over time where only those with the lowest cost advantage and lowest cost of capital can survive. Retail is no different. The overbuilding of retail outlets only helped to accelerate this process. To ease the pain of excess capacity, retailers do what companies do in such circumstances; they disrupt long-standing equilibrium and kick off an arms race by squeezing their suppliers without mercy. Retailers demanded higher margins, return allowances, marketing contributions, markdown dollars and hundreds of other “programs” that all favor the retailer and stack the deck against the consumer product company. To add insult to injury, retailers also resorted to private labelling and knocking off their suppliers’ best selling products to capture more of the margin dollars on fast moving products. And to top it off, in order to attract traffic in an increasingly homogenized world, retailers have taken to a strategy of endless discounting which weakens the brands they carry and erodes much needed contribution margin. All of which has created a feedback loop which puts pressure on retail execs to squeeze their suppliers even more. If you have ever spent more than 15 minutes working with large retailers, you know they are perpetually craving new products. They are forever addicted to the next hit product because hit products bring the thing they need the most: foot traffic. So, instead of cultivating and developing relationships with emerging brands by offering incentives to innovate in concert with the retailer (they will tell you they do this but ask any new brand how their roll-out at “mega store x” went and you will hear a different story), they deploy draconian contractual provisions which are exactly the opposite of what fragile, new companies need to succeed and continue innovating. The key takeaway is that the retailers themselves have created a serious threat to their flow of product. As I mentioned above, Amazon is without a doubt a major competitive threat, but what most people don’t realize is that the retailers have been busy strangling themselves. All of which leads us to the current “death of retail” moment. Open SaaS gives you the flexibility you need to stand out, the data orchestration you need for operational efficiency and the low total cost of ownership that lets’ you reallocate dollars to marketing spend, not technology debt. Whether you are an emerging brand or an industry giant, in the last few years, there has been a proliferation of SaaS tools that enable a company to control every aspect of the consumer product value chain. Whether it is developing and sourcing new products or targeting and converting new customers, tools like BigCommerce, Mailchimp, OptinMonster, ShipStation and many, many more have greatly reduced the barriers to entry for conceiving of, producing, marketing and fulfilling a consumer product. As is typical when you dramatically lower the barriers to entry for a given industry, a wave of new start-ups enter the market shortly thereafter. New brands are quite literally popping up every day. While many of these brands will fail, the truly innovative ones will succeed. 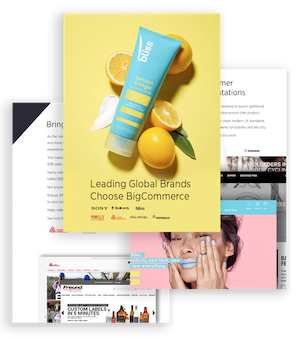 And now, instead of having to hope they get picked up by large retailers, they can start selling in a matter of minutes using BigCommerce. There is no need for rent. No need for long-term contracts. Just sign up for a free trial of your favorite ecommerce platform, connect your free Mailchimp account and you are on your way. Large consumer product companies have adapted too. In response to retailers attempts at gaining leverage on their suppliers, large consumer product companies have launched their own counter-measures such as building out direct-to-consumer channels while smaller players have been forced out of business or have had to dramatically alter their channel strategy. Now, instead of relying on the foot traffic of retailers, they can target new customers with microscopic precision. These same brands can fulfill their orders directly through their own distribution network or the many capable 3PL players in the market. Getting direct access to the end consumer has never been easier on one hand and it has never been more competitive on the other. These changes have delivered the last thing traditional brick-and-mortar retailers needed; more competition. A deep-dive analysis of the rise of the microbrand using hyper-targeted marketing and just-in-time manufacturing by Scott Belsky, CPO at Adobe. Read it on Medium here. Large consumer product companies that have had enough of the draconian terms forced upon them by the largest players in retail. So, now retailers find themselves fighting a three front war all the while the underlying economics of the retail business worsen. Retailers are being clubbed by the almighty Amazon while being subjected to the death of a thousand cuts from new brands that are chipping away at every conceivable niche and micro-niche. Not surprisingly, the number of retail bankruptcy filings has increased significantly and is unlikely to subside any time soon. At the time of writing in 2018, there have already been 6 retail bankruptcies. The dynamics outlined above are not short-term disruptions to an otherwise healthy market. They are significant and long-lasting changes that will require wholesale changes in operating tactics, channel strategies and financial levers. Historically, change of this scale works out poorly for the incumbents. John Lott is an investor, advisor and CEO at Mentoris Capital Partners and SPP, Inc., the parent companion Nelson JIT and Tucson Abrasives.He serves on the board of advisors as an acting CFO for Spearmint LOVE, a rising micro-brand. He also sits on the board of advisors for Craft Coffee and Urbio.Formerly, he was the advisor to the CEO at Quirky and SVP at Cerberus Capital Management.